Saturn has many, varied moons – over 60 have been discovered so far. One of the larger ones, Dione, is shown here in this image from the Cassini orbiter, pictured as it moved across the face of its parent planet. Dione orbits Saturn at around 377 400 km, roughly the same distance as that between Earth and the Moon. It has a diameter of around a third that of the Moon, and is just under 1.5 times as dense as liquid water. While the moon is thought to be mostly water ice, this higher density indicates that it must have a core of dense material – most likely silicates, the same kind of rock that makes up Earth’s mantle. 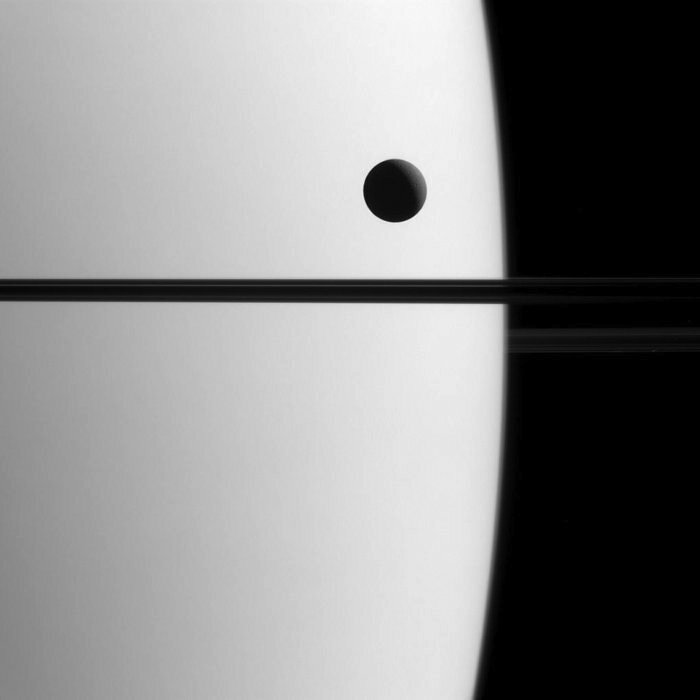 In this image, Dione is seen passing across the face of Saturn, a phenomenon known as a transit. The dark line cutting across the middle of the frame marks Saturn’s rings – these are not illuminated from this perspective, which was about 0.3º below the ring plane. Transits occur when one celestial body passes in front of another. They are seen most often when moons pass in front of their parent planets, or planets (or even moons) in front of their parent stars. Transits are important events in astronomy, allowing observers to investigate the transiting body’s atmosphere and orbit in greater detail. We can see a number of transits from Earth, such as when Mercury and Venus pass between the Sun and Earth, and show up clearly as black dots moving across the Sun’s bright disc. Using powerful telescopes, we can also study more distant planets in other star systems as they pass in front of their stars. Scientists rely heavily on transits in their hunt for and study of exoplanets. Dione orbits within Saturn’s magnetosphere, a region of space surrounding the planet that is filled with highly energetic atomic particles. These particles rain down on Dione and smash into its surface. Dione is too small with too little gravity to hold on to an atmosphere of its own, but this continuous high-energy bombardment releases molecules from the moon’s surface that form a thin, atmosphere-like layer. This tenuous atmosphere was discovered during two of Cassini’s close flybys of Dione, on 11 October 2005 and 7 April 2010. Cassini acquired this visible-light view using its narrow-angle camera when it was 2.3 million km from Saturn on 21 May 2015. The image scale is 14 km per pixel.